I noticed some bugs and I want to report it. 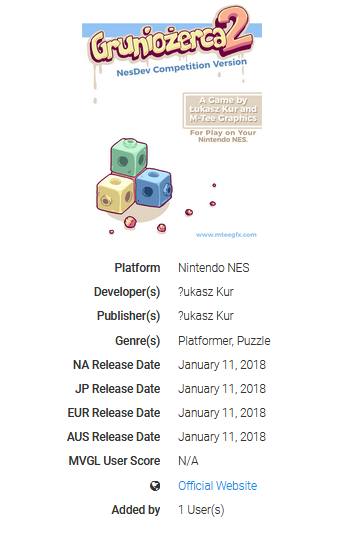 Publisher and Developer should be a "Łukasz Kur". It is polish name with polish letter. I know it can be a problem, that I suggest use "L" instead of "Ł". In the Recent Gamer Updates, this "é" is not display. Sorry for troubling you in those minor issues. Can you provide the URLs to these game so we can further investigate? So this issue still needs to be resolved. I've noticed that special characters don't always work, or rather, "add-on" characters such as é and Ō. The entry I see most often would be Pokémon which sometimes becomes Pok?mon in the gamer feed and on user lists. It doesn't affect all Pokémon entries nor all users. One user can add several Pokémon games with only one of the games showcasing this issue, and another user can later add that exact game without the issue. None else who added the game for Switch had this issue though. I had this issue myself with the game "Kingdom Hearts 0.2: Birth by Sleep - A Fragmentary Passage" which became "Kingdom Hearts 0.2: Birth by Sleep ? A Fragmentary Passage" in feed and list. I fixed this by changing the "-" symbol and adding the game again. Don't think this is viable for all games with this issue though. 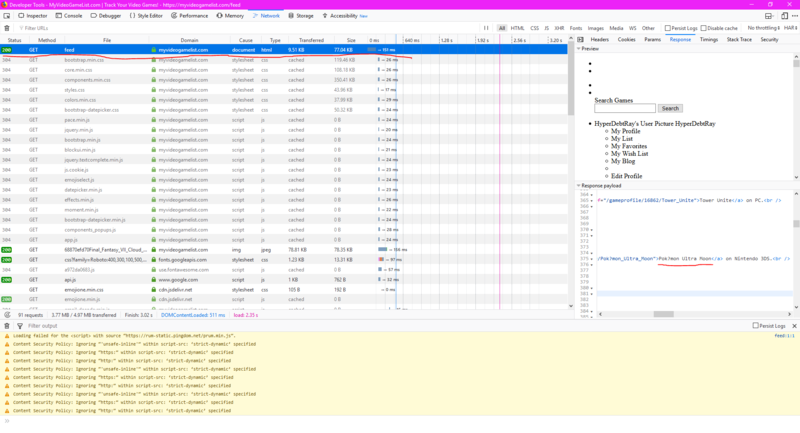 I have no idea what is causing the issue, nor why only some games and some users are affected, but we really need to fix this issue site-wide. @bergdoll That screenshot seems to be from August, a bit too old. I cannot replicate this issue. If anyone can provide clear, concise replication steps we'd be happy to take a further look into it. Just reconfirming that it seems to appeared today as well Oct. 28 2018. I looked at the http response and it doesn't seem like a browser issue if the server is sending the question mark, unfortunately I don't have any repro steps as I've failed to repro this myself. Pokémon Ultra Moon is located down in the dropped section. Right above it is another title with the issue, "Phoenix Wright: Ace Attorney ? Justice for All". The question mark should be some form of the "-" symbol. Yeah, I have the issue as well, for Pokemon games. 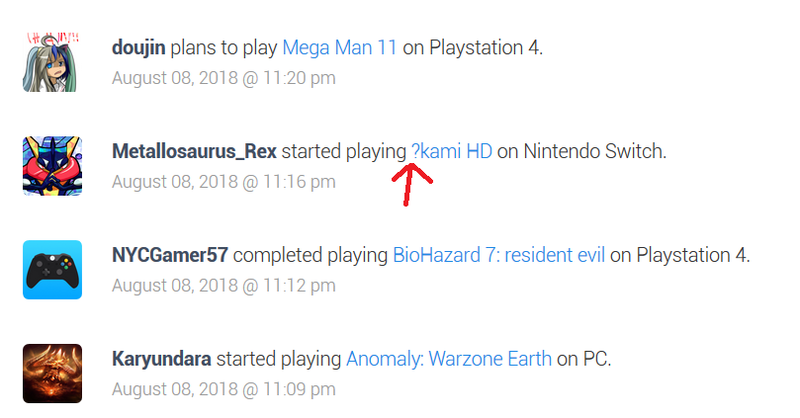 I noticed that the error only happens after you edit the game entry which you already added in your list. So for example. if I edited my list entry for Pokemon Black, the error would pop up. Only fix I found is to remove the entry from your list, and add it again. Date today is November 10th 2018. I should also mention, the games are in my Completed list. I don't think it matters whether the game is in the Dropped, Completed, On-Hold, etc. category. The error will appear if you edit your entry, which would include moving your game from your Continuously Playing list to your dropped list, because that is editing the entry you made in your list. It seems like the "–" symbol tend to become question marks. Do note that "–" is different from regular "-". I'm not sure which symbol the longer dash is supposed to be but it tends to be used on various sites from which we copy paste titles, gamefaqs and IGN for example. So right now the confirmed symbols which has this issue would be "–", "é" and "Ō". Let's be on the lookout for more. 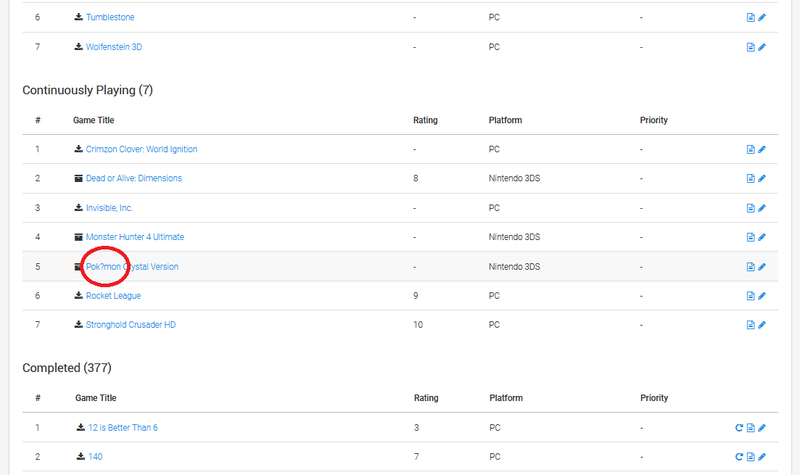 The issue is definitely triggered by adding a game directly to your list, as I've experienced myself. Good to know that editing a previously existing game also can trigger the issue though. I will use this post to continuously update with examples where the issue occurs. I assume that the stack running the site is PHP, MySQL? We finally managed to resolve this issue. Turns out notmuchofagamer was correct all along. Switching status was the (only) cause of the issue, and consistently so. Had we only tried troubleshot that we could've resolved this issue three months ago.